Precut saunas are ideal for installing in new home constructions, additions, or when doing a remodeling project. With a Finlandia kit, you have the opportunity to select from a variety of pre-cut sauna rooms that are designed and built by a US company founded by Finns who had the goal of bringing the authentic Finnish sauna to the North American market. What is the difference between precut saunas and pre-fab kits? The pre-fabs are far more expensive since the wall sections have been built for you. This can add thousands of dollars to the cost of the kit. For example, if you compare a 6'x6' Prefab Sauna with the same design of a 6'x6' Precut Home Sauna, it’s essentially the same 4-person sauna with the same room layout and heater but for $2000 less. 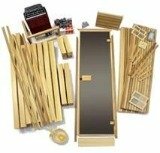 The materials package you order for precut saunas are custom cut to the exact stud-to-stud dimensions on the frame you’ll build in your home sauna space. You do the frame, wiring, and insulation, as well as the rough opening for the door (usually 26" x 82"). Pre-cut sauna rooms can take 14 to 18 hours to install but are prized features and add value to any new or remodeled home. 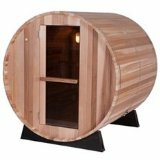 Find a wide selection of precut saunas at great prices here! 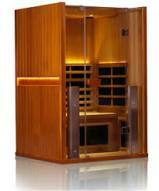 With pre-cut sauna rooms you have the freedom to order your choice of wood. The standard wood used by Finlandia is the beautiful clear Western Red Cedar, but you can option for: clear V.G. Redwood, clear Alaskan Yellow Cedar, or clear Western Hemlock. These softwoods are ideal for sauna use as they are able to absorb the steam and withstand any damage from the constant 180°F heat. Finlandia Sauna is located in Portland, Oregon, and has been in the business of making Finnish hot rocks saunas since 1964. 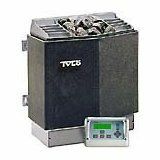 They supply their customers with quality sauna heaters imported from Harvia Oy in Finland. Even the company’s founder, Reino Tarkiainen, is a native of Finland. In fact, everything about Finlandia precut saunas and prefab saunas reflect an “old country” love and reverence for saunas, just as you would find in the sauna’s country of origin.